This simple recipe for salt and pepper calamari (also known as salt and pepper squid) is fast and delicious to cook up - plus it's low-fat compared to the usually deep-fried calamari. This dish is superb when grilled on the barbecue, literally taking only minutes to cook. The salt & pepper barbecue rub is equally easy to make - just toss a few dry spices together, and you're done! This calamari recipe makes a great appetizer, or serve as the main course together with rice, a salad, or other side dishes. 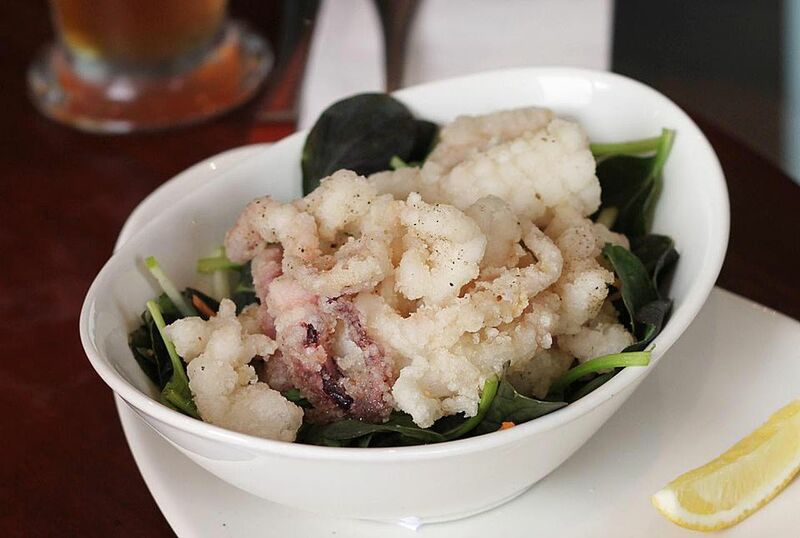 And if the weather doesn't cooperate, this calamari can also be pan-fried. Enjoy! Using a knife, cut open the calamari tubes so that they lie flat. Rinse the calamari and place on a tea towel or absorbent paper. Pat them dry. Dry them as well as possible, otherwise, the spice mixture won't stick. Cut the calamari lengthwise into strips (approx. 1 inch wide), and place in a mixing bowl. Drizzle the oil over the calamari and stir, ensuring all surfaces are covered. Mix the dry spices together in a cup or small bowl, then sprinkle over the oiled calamari. Toss until all the calamari strips are coated in the spices. Set aside to marinate while you heat up the grill. Lightly brush your grill with oil, then cook the calamari until edges curl up (some strips may curl completely into a circle) - this only takes 2-3 minutes per side, depending on the heat of your grill. Cooking tips: You want the calamari to be lightly browned and chewy, but not rubbery, so try not to overcook it. If your grill bars are too wide (so that the calamari might fall through), use a fish cage or place a piece of banana leaf (or foil) over the grill surface and cook over it. Place the calamari on a serving platter (if desired, over a bed of baby greens). Cut the 1/2 lime into wedges and squeeze over. Taste-test the calamari. If not salty enough, sprinkle over a little fish sauce or more salt. If too salty for your taste, add more fresh-squeezed lime juice. Add a final sprinkling of fresh coriander. Serve with Thai Sweet Chili Sauce for dipping. Note that this dish can be served over salad or with rice for a complete meal. ENJOY! To pan-fry the calamari indoors: Heat up your wok or frying pan (place the dry pan over medium-high heat for at least 1 minute). Add about 1 tablespoon oil and swirl around, then add the calamari. Turn the heat down to medium and pan-fry 1-2 minutes per side, or until the calamari is lightly browned and curls up around the edges. Again, don't overcook, or it will no longer be tender. Serve as instructed above, and enjoy!